Want more from life? You can achieve your most cherished personal goals, says Tae Yun Kim, one of the first women to become a martial arts grandmaster. She knows firsthand how to overcome barriers. A motivational speaker and entrepreneur, she is the author of SEVEN STEPS TO INNER POWER: How To Break Through To Awesome, Life Secrets From a Martial Arts Master. You have the power to transform your life. Author, motivational speaker, martial arts grandmaster, and entrepreneur Tae Yun Kim has helped thousands of people connect with that inner power, enabling them to attain goals they once thought were far beyond their reach. In her new book, SEVEN STEPS TO INNER POWER: How To Break Through To Awesome, Life Secrets From a Martial Arts Master she shares her secrets – based on her own experiences and rooted in ancient martial arts tradition – which will allow anyone to break through the barriers blocking their dreams. Dr. Kim’s life story is one of triumphing against the odds. A first-born girl in a culture that viewed her birth as an omen of bad luck, she defied not only her family but 5000 years of Korean tradition to begin martial arts training at the age of seven, ultimately becoming one of the highest-ranking martial artists in the world. She is truly a renaissance woman with a wide range of interests in the arts and business. Not only did she create her own martial arts school, but she has founded other businesses including Lighthouse Worldwide Solutions, a manufacturer of cleanroom monitoring systems and particle counters. Truth – Truth is the process of self-discovery. “When you want to create change, you must be brave in facing the truth—the truth of your current weaknesses and the truth of your innate strengths—and you must be adventurous in taking charge of your life and implementing that change,” writes Dr. Kim. She urges people to think about what stories they tell themselves about why they are “stuck” – and envision how they would look and act if they were free from whatever is limiting them. Purity – “When we affirm the truth of our original nature and reject foreign, limited concepts about ourselves, we are expressing purity,” Dr. Kim contends. This means not holding onto poisonous states of mind like anger, jealousy, frustration, and hurt. Dr. Kim emphasizes the importance of daily “cleansing” and explains how to make your daily shower a time for valuable inner work. Love – Before you can love another, you must first love yourself. When you really love yourself, you do the things that help you maintain and build your energy and life force, not tear them down, says Dr. Kim. She suggests greeting every day as if you’re preparing for a date with yourself. Bring your best self to every day of your life. Loyalty – Loyalty, as one of the seven steps, means commitment and dedication to one’s own life. That is, putting your real self forward with confidence, conviction,determination, purpose, power, and love. Loyalty also means sticking with your goals and plans in the long term. One tool the author suggests to remind you to stay loyal to your goals is to “clock” where you are on your personal life journey. “See your life as a twenty-four-hour cycle and imagine what time it is right now for you,” she writes. Sacrifice – “When you are trying to create a lasting change in your life, old habits and new habits cannot exist side by side,” writes Dr. Kim. Sacrifice means giving up those things that are getting in the way of your goals – whether they are habits like drinking too much, or negative thoughts that are undermining your sense of self. She advises that when you are facing a sacrifice, you shouldn’t think of it as something you are being forced to give up. Instead, focus on why you want to give it up. Patience – Patience is the final step in the creative process, Dr. Kim argues. It is here that impatient people may backslide and lose the benefits of all their hard work. “Your life is always a work in progress. It takes time for you to grow and mature,” the author writes. She points to the metamorphosis of the caterpillar into a butterfly as one of the most beautiful symbols of patience. Throughout, Dr. Kim provides practical exercises to guide people through their journey to inner power. She also details the mental habits that will boost confidence by ending self-defeating ways of thinking, and she shares success stories from among the many people she has counseled and trained. “Amazing things can happen if you are willing to step outside the lines you draw in your own mind,” Dr. Kim proclaims. SEVEN STEPS TO INNER POWER is a compelling guide to fearless living that will enable anyone to rethink what is possible—and to reach for it with gusto. Tae Yun Kim is a martial arts great grandmaster, author, motivational speaker, and entrepreneur. As head coach, she led the first-ever U.S. women’s Tae Kwon Do team to a gold medal at the Pre-World Games in Seoul, helping pave the way for women to compete in martial arts in the Olympics. 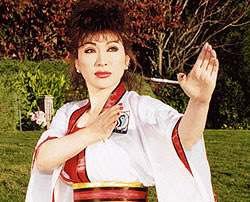 Dr. Kim went on to found her own school of martial arts, aimed at overcoming limitations in every area of life. She is also the founder and CEO of Lighthouse Worldwide Solutions, a leading high-tech Silicon Valley company, and has won many awards for her achievements and humanitarian service. She received an honorary Ph.D. in Business Administration from Korea’s Sook Myung Women’s University and was named “Hope of the Country of Korea” by Korea’s former President Kim Dae Jung for her work encouraging people to overcome their losses and build new hope and success. In 2017, she won two Stevie Awards for Women in Business: one for lifetime achievement and the other for best new product. To learn more, visit: www.taeyunkim.com. This entry was posted in Lifestyle and tagged 5 Ways Women Can Smash Mental Barriers To Success.